When I first visited New Zealand in 1994 I was impressed by its astounding landscapes — the stunning beauty of its landforms, coasts and islands. However, I was soon not so enamored of its much-publicized “clean green” image when I realized the incredible destruction wrought on the ecosystem by its small (4 million) human population, their huge flocks and herds of livestock and the alien species they’d introduced, including rabbits and stoats. Before long, indeed, I’d learned far too much for comfort about the depredations and wave of extinctions visited on New Zealand’s environment by its European colonizers and those who followed. Don’t get me wrong; I love New Zealand, not least for its wonderful people, but it has had a very rocky environmental history and attempts to protect what remains have left much of nature there feeling just too organized. I believed it, that is, until this spring, when I had something of an awakening. It took another voyage to far-flung islands and lands, but this time northward from Hokkaido along the chain of the Kuril Islands to the Kamchatka Peninsula and the Kommandorskiye Islands in the Russian Far East — not southward to New Zealand — for me to appreciate things I have almost on my own doorstep and to see them from a different perspective. After an island-hopping trip through the Kurils, early June this year found me walking in woodland near my friend’s Siberian Husky kennels north of the city of Petropavlovsk-Kamchatskiy. There, despite the late date, spring seemed to have barely begun. In fact it had taken weeks to raise a stink from the undergrowth just emerging from the heavy blanket of winter snows. I am not being rude; I’m just referring to the “stink” of what locals in Kamchatka call “victory onions” — and I call wild garlic (Allium victorialis). At home in Hokkaido, I have heard the same plant called Ainu-negi or gyoujya-ninniku, and both there and in northern Honshu, as in Kamchatka, it is a popular wild “mountain vegetable” that people collect in spring. 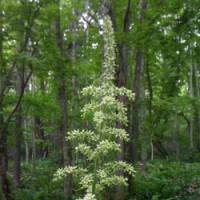 Call it what you will, it’s the same plant, and if you take a springtime stroll through northern deciduous woods you can hardly avoid crushing its stems beneath your boots and releasing their sharp, garlic-like aroma. However, where the “victory onions” in Kamchatka were rising barely a few centimeters above the ground, another plant was towering over them, already 30 cm tall with strangely concertinaed leaves looking like they’d been neatly pleated and folded by a designer aiming to please. 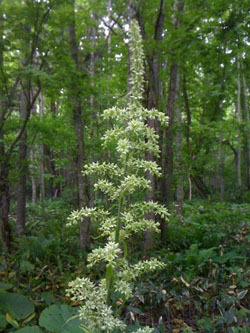 This plant unfurling its livid-green leaves was the poisonous white false hellebore (Veratrum album). 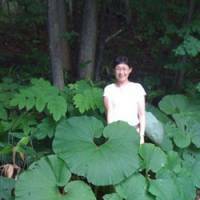 On my return to Hokkaido from Kamchatka, and on my first visit back to my favorite patch of lowland forest in Nopporo, I found the very same woodland plant already nearing an amazing 2 meters in height, and with enormous leaves — a veritable megaherb. 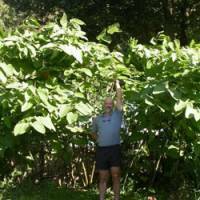 I was struck by the similarity in leaf form to the Pleurophyllum of New Zealand’s subantarctic islands. Then suddenly — though rather belatedly, I must confess — I realized that megaherbs are not only confined to the far south. The false hellebores here were already producing their tall spires of surprisingly delicate pale-green flowers, while in damper patches of the same forest I found another native megaherb — a Japanese or giant butterbur (Petasites japonicus), known as fuki in Japanese, whose large, rhubarb-like leaves as broad as umbrellas entirely covered some patches of the forest floor. Butterbur flowers are among the very first to appear here, pushing up from the still chilly soils in early spring in concert with the creamy white flutes of giant skunk cabbage (Lysichiton camtschatcense), known as mizu-bashou in Japanese, that appear along streamsides and in swampy areas from Honshu to eastern Siberia. 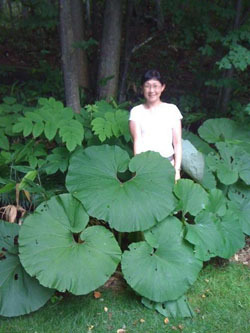 The elongate, sky-pointing leaves of that plant continue to grow and enlarge, like the butterbur, long after flowering has finished — making the giant skunk cabbage yet another northern megaherb. Here and there in the forest, the frothy white charms of umbellifers stand tall and elegant above the sea of monster megaherb leaves, their flowers carried on stalks of the same length radiating from the same points like spokes of an umbrella and their long hollow stems a sort of botanical scaffolding strung with lace reaching for the sun. Do they also qualify as megaherbs? Perhaps not, they seem too fragile, their leaves too small, though their height can be impressive. Now, with the rainy season upon us, the large-leaved megaherbs not only dominate the visual appearance of our northern forests, they also affect the sylvan soundscape. Large drops of rain, falling from the tree canopy above, splash with a loud slapping noise as they hit the leaves. Finer rain patters gently, the drops pearling independently on leaf surfaces, then eventually rolling, merging and collecting into tiny light-gathering pools in the creases, pleats or indents of each leaf. The damp, the dripping, the humidity, and the proliferating insects all indicate that summer is here, and soon another megaherb will make itself conspicuous as it bursts into flower. 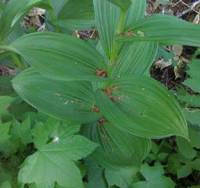 Lush green megaherbs are not confined beneath the canopy of the northern woods. 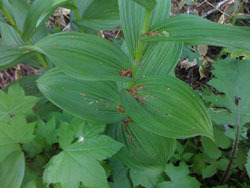 Alongside tracks and trails in more brightly lit areas, lengthening stems with rosettes of broad, dark-green leaves around them at the base are those of the heart-leaved lily (Lilium cordatum). They seem to do well where the ground has been compacted somewhat, and at this time of year they are raising their large creamy flowers into the flightpaths of swallowtail butterflies and bumblebees. In autumn, they produce pods densely filled with winged seeds like potato chips in a tube. But that’s not all yet, for beyond the woods, in many sunlit patches across the land are to be found clumps of clattering stems, their tips nodding and bowing on the breeze and producing inflorescences of fine off-white flowers. 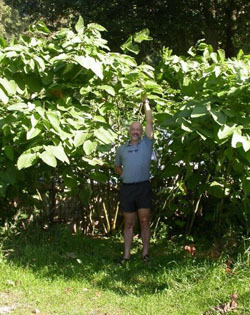 This plant is infamous where it has been introduced abroad — and is actually deemed one of the 100 worst invasive plants worldwide — but here, both Japanese knotweed (Polygonum / Fallopia japonica) and giant knotweed (Polygonum / Fallopia sachalinense) are yet more native megaherbs.